For the musical term, see Riemannian theory. The real part (red) and imaginary part (blue) of the Riemann zeta function along the critical line Re(s) = 1/2. The first non-trivial zeros can be seen at Im(s) = ±14.135, ±21.022 and ±25.011. In mathematics, the Riemann hypothesis is a conjecture that the Riemann zeta function has its zeros only at the negative even integers and complex numbers with real part 1/2. Many consider it to be the most important unsolved problem in pure mathematics (Bombieri 2000). It is of great interest in number theory because it implies results about the distribution of prime numbers. It was proposed by Bernhard Riemann (1859), after whom it is named. The Riemann hypothesis and some of its generalizations, along with Goldbach's conjecture and the twin prime conjecture, comprise Hilbert's eighth problem in David Hilbert's list of 23 unsolved problems; it is also one of the Clay Mathematics Institute's Millennium Prize Problems. The name is also used for some closely related analogues, such as the Riemann hypothesis for curves over finite fields. The real part of every non-trivial zero of the Riemann zeta function is 1/2. Thus, if the hypothesis is correct, all the non-trivial zeros lie on the critical line consisting of the complex numbers 1/2 + i t, where t is a real number and i is the imaginary unit. There are several nontechnical books on the Riemann hypothesis, such as Derbyshire (2003), Rockmore (2005), (Sabbagh 2003a, 2003b), du Sautoy (2003). The books Edwards (1974), Patterson (1988), Borwein et al. (2008), Mazur & Stein (2015) and Broughan (2017) give mathematical introductions, while Titchmarsh (1986), Ivić (1985) and Karatsuba & Voronin (1992) are advanced monographs. where the infinite product extends over all prime numbers p.
(see Dirichlet eta function). The zeta function can be extended to these values too by taking limits, giving a finite value for all values of s with positive real part except for the simple pole at s = 1. One may then define ζ(s) for all remaining nonzero complex numbers s by applying this equation outside the strip, and letting ζ(s) equal the right-hand side of the equation whenever s has non-positive real part. If s is a negative even integer then ζ(s) = 0 because the factor sin(πs/2) vanishes; these are the trivial zeros of the zeta function. (If s is a positive even integer this argument does not apply because the zeros of the sine function are cancelled by the poles of the gamma function as it takes negative integer arguments.) The value ζ(0) = −1/2 is not determined by the functional equation, but is the limiting value of ζ(s) as s approaches zero. The functional equation also implies that the zeta function has no zeros with negative real part other than the trivial zeros, so all non-trivial zeros lie in the critical strip where s has real part between 0 and 1. "...es ist sehr wahrscheinlich, dass alle Wurzeln reell sind. Hiervon wäre allerdings ein strenger Beweis zu wünschen; ich habe indess die Aufsuchung desselben nach einigen flüchtigen vergeblichen Versuchen vorläufig bei Seite gelassen, da er für den nächsten Zweck meiner Untersuchung entbehrlich schien." The terms Li(xρ) involving the zeros of the zeta function need some care in their definition as Li has branch points at 0 and 1, and are defined (for x > 1) by analytic continuation in the complex variable ρ in the region Re(ρ) > 0, i.e. they should be considered as Ei(ρ ln x). The other terms also correspond to zeros: the dominant term Li(x) comes from the pole at s = 1, considered as a zero of multiplicity −1, and the remaining small terms come from the trivial zeros. For some graphs of the sums of the first few terms of this series see Riesel & Göhl (1970) or Zagier (1977). This formula says that the zeros of the Riemann zeta function control the oscillations of primes around their "expected" positions. Riemann knew that the non-trivial zeros of the zeta function were symmetrically distributed about the line s = 1/2 + it, and he knew that all of its non-trivial zeros must lie in the range 0 ≤ Re(s) ≤ 1. He checked that a few of the zeros lay on the critical line with real part 1/2 and suggested that they all do; this is the Riemann hypothesis. The practical uses of the Riemann hypothesis include many propositions known true under the Riemann hypothesis, and some that can be shown to be equivalent to the Riemann hypothesis. where π(x) is the prime-counting function, and log(x) is the natural logarithm of x.
where ψ(x) is Chebyshev's second function.
. This is an explicit version of a theorem of Cramér. The Riemann hypothesis implies strong bounds on the growth of many other arithmetic functions, in addition to the primes counting function above. for all n > 5040 if and only if the Riemann hypothesis is true, where γ is the Euler–Mascheroni constant. is the number of terms in the Farey sequence of order n.
for all sufficiently large n.
so the growth rate of ζ(1+it) and its inverse would be known up to a factor of 2 (Titchmarsh 1986). The prime number theorem implies that on average, the gap between the prime p and its successor is log p. However, some gaps between primes may be much larger than the average. Cramér proved that, assuming the Riemann hypothesis, every gap is O(√p log p). This is a case in which even the best bound that can be proved using the Riemann hypothesis is far weaker than what seems true: Cramér's conjecture implies that every gap is O((log p)2), which, while larger than the average gap, is far smaller than the bound implied by the Riemann hypothesis. Numerical evidence supports Cramér's conjecture (Nicely 1999). holds for all ε > 0 if and only if the Riemann hypothesis holds. Weil's criterion is the statement that the positivity of a certain function is equivalent to the Riemann hypothesis. Related is Li's criterion, a statement that the positivity of a certain sequence of numbers is equivalent to the Riemann hypothesis. has only simple zeros on the critical line is equivalent to its derivative having no zeros on the critical line. The Farey sequence provides two equivalences, due to Jerome Franel and Edmund Landau in 1924. Several applications use the generalized Riemann hypothesis for Dirichlet L-series or zeta functions of number fields rather than just the Riemann hypothesis. Many basic properties of the Riemann zeta function can easily be generalized to all Dirichlet L-series, so it is plausible that a method that proves the Riemann hypothesis for the Riemann zeta function would also work for the generalized Riemann hypothesis for Dirichlet L-functions. Several results first proved using the generalized Riemann hypothesis were later given unconditional proofs without using it, though these were usually much harder. Many of the consequences on the following list are taken from Conrad (2010). In 1913, Grönwall showed that the generalized Riemann hypothesis implies that Gauss's list of imaginary quadratic fields with class number 1 is complete, though Baker, Stark and Heegner later gave unconditional proofs of this without using the generalized Riemann hypothesis. which says that in some sense primes 3 mod 4 are more common than primes 1 mod 4. In 1923 Hardy and Littlewood showed that the generalized Riemann hypothesis implies a weak form of the Goldbach conjecture for odd numbers: that every sufficiently large odd number is the sum of three primes, though in 1937 Vinogradov gave an unconditional proof. In 1997 Deshouillers, Effinger, te Riele, and Zinoviev showed that the generalized Riemann hypothesis implies that every odd number greater than 5 is the sum of three primes. In 1934, Chowla showed that the generalized Riemann hypothesis implies that the first prime in the arithmetic progression a mod m is at most Km2log(m)2 for some fixed constant K.
In 1967, Hooley showed that the generalized Riemann hypothesis implies Artin's conjecture on primitive roots. In 1973, Weinberger showed that the generalized Riemann hypothesis implies that Euler's list of idoneal numbers is complete. Weinberger (1973) showed that the generalized Riemann hypothesis for the zeta functions of all algebraic number fields implies that any number field with class number 1 is either Euclidean or an imaginary quadratic number field of discriminant −19, −43, −67, or −163. In 1976, G. Miller showed that the generalized Riemann hypothesis implies that one can test if a number is prime in polynomial time via the Miller test. In 2002, Manindra Agrawal, Neeraj Kayal and Nitin Saxena proved this result unconditionally using the AKS primality test. Odlyzko (1990) discussed how the generalized Riemann hypothesis can be used to give sharper estimates for discriminants and class numbers of number fields. Ono & Soundararajan (1997) showed that the generalized Riemann hypothesis implies that Ramanujan's integral quadratic form x2 + y2 + 10z2 represents all integers that it represents locally, with exactly 18 exceptions. Care should be taken to understand what is meant by saying the generalized Riemann hypothesis is false: one should specify exactly which class of Dirichlet series has a counterexample. This concerns the sign of the error in the prime number theorem. It has been computed that π(x) < Li(x) for all x ≤ 1023, and no value of x is known for which π(x) > Li(x). See this table. Thus the difference π(x) − Li(x) changes sign infinitely many times. Skewes' number is an estimate of the value of x corresponding to the first sign change. This is the conjecture (first stated in article 303 of Gauss's Disquisitiones Arithmeticae) that there are only a finite number of imaginary quadratic fields with a given class number. One way to prove it would be to show that as the discriminant D → −∞ the class number h(D) → ∞. Theorem (Deuring; 1933). If the RH is false then h(D) > 1 if |D| is sufficiently large. Theorem (Mordell; 1934). If the RH is false then h(D) → ∞ as D → −∞. Theorem (Heilbronn; 1934). If the generalized RH is false for the L-function of some imaginary quadratic Dirichlet character then h(D) → ∞ as D → −∞. In 1935, Carl Siegel later strengthened the result without using RH or GRH in any way. for infinitely many n, where φ(n) is Euler's totient function and γ is Euler's constant. The method of proof is interesting, in that the inequality is shown first under the assumption that the Riemann hypothesis is true, secondly under the contrary assumption. The Riemann hypothesis can be generalized by replacing the Riemann zeta function by the formally similar, but much more general, global L-functions. In this broader setting, one expects the non-trivial zeros of the global L-functions to have real part 1/2. It is these conjectures, rather than the classical Riemann hypothesis only for the single Riemann zeta function, which account for the true importance of the Riemann hypothesis in mathematics. The generalized Riemann hypothesis extends the Riemann hypothesis to all Dirichlet L-functions. In particular it implies the conjecture that Siegel zeros (zeros of L-functions between 1/2 and 1) do not exist. The extended Riemann hypothesis extends the Riemann hypothesis to all Dedekind zeta functions of algebraic number fields. The extended Riemann hypothesis for abelian extension of the rationals is equivalent to the generalized Riemann hypothesis. The Riemann hypothesis can also be extended to the L-functions of Hecke characters of number fields. The grand Riemann hypothesis extends it to all automorphic zeta functions, such as Mellin transforms of Hecke eigenforms. is actually an instance of the Riemann hypothesis in the function field setting. This led Weil (1949) to conjecture a similar statement for all algebraic varieties; the resulting Weil conjectures were proved by Pierre Deligne (1974, 1980).
. This is known for schemes in positive characteristic and follows from Pierre Deligne (1974, 1980), but remains entirely unknown in characteristic zero. Selberg (1956) introduced the Selberg zeta function of a Riemann surface. These are similar to the Riemann zeta function: they have a functional equation, and an infinite product similar to the Euler product but taken over closed geodesics rather than primes. The Selberg trace formula is the analogue for these functions of the explicit formulas in prime number theory. Selberg proved that the Selberg zeta functions satisfy the analogue of the Riemann hypothesis, with the imaginary parts of their zeros related to the eigenvalues of the Laplacian operator of the Riemann surface. The Ihara zeta function of a finite graph is an analogue of the Selberg zeta function, which was first introduced by Yasutaka Ihara in the context of discrete subgroups of the two-by-two p-adic special linear group. A regular finite graph is a Ramanujan graph, a mathematical model of efficient communication networks, if and only if its Ihara zeta function satisfies the analogue of the Riemann hypothesis as was pointed out by T. Sunada. Montgomery (1973) suggested the pair correlation conjecture that the correlation functions of the (suitably normalized) zeros of the zeta function should be the same as those of the eigenvalues of a random hermitian matrix. Odlyzko (1987) showed that this is supported by large scale numerical calculations of these correlation functions. Montgomery showed that (assuming the Riemann hypothesis) at least 2/3 of all zeros are simple, and a related conjecture is that all zeros of the zeta function are simple (or more generally have no non-trivial integer linear relations between their imaginary parts). Dedekind zeta functions of algebraic number fields, which generalize the Riemann zeta function, often do have multiple complex zeros (Radziejewski 2007). This is because the Dedekind zeta functions factorize as a product of powers of Artin L-functions, so zeros of Artin L-functions sometimes give rise to multiple zeros of Dedekind zeta functions. Other examples of zeta functions with multiple zeros are the L-functions of some elliptic curves: these can have multiple zeros at the real point of their critical line; the Birch-Swinnerton-Dyer conjecture predicts that the multiplicity of this zero is the rank of the elliptic curve. There are many other examples of zeta functions with analogues of the Riemann hypothesis, some of which have been proved. Goss zeta functions of function fields have a Riemann hypothesis, proved by Sheats (1998). The main conjecture of Iwasawa theory, proved by Barry Mazur and Andrew Wiles for cyclotomic fields, and Wiles for totally real fields, identifies the zeros of a p-adic L-function with the eigenvalues of an operator, so can be thought of as an analogue of the Hilbert–Pólya conjecture for p-adic L-functions (Wiles 2000). Several mathematicians have addressed the Riemann hypothesis, but none of their attempts have yet been accepted as a correct solution. Watkins (2007) lists some incorrect solutions, and more are frequently announced. Hilbert and Pólya suggested that one way to derive the Riemann hypothesis would be to find a self-adjoint operator, from the existence of which the statement on the real parts of the zeros of ζ(s) would follow when one applies the criterion on real eigenvalues. Some support for this idea comes from several analogues of the Riemann zeta functions whose zeros correspond to eigenvalues of some operator: the zeros of a zeta function of a variety over a finite field correspond to eigenvalues of a Frobenius element on an étale cohomology group, the zeros of a Selberg zeta function are eigenvalues of a Laplacian operator of a Riemann surface, and the zeros of a p-adic zeta function correspond to eigenvectors of a Galois action on ideal class groups. Odlyzko (1987) showed that the distribution of the zeros of the Riemann zeta function shares some statistical properties with the eigenvalues of random matrices drawn from the Gaussian unitary ensemble. This gives some support to the Hilbert–Pólya conjecture. The analogy with the Riemann hypothesis over finite fields suggests that the Hilbert space containing eigenvectors corresponding to the zeros might be some sort of first cohomology group of the spectrum Spec (Z) of the integers. Deninger (1998) described some of the attempts to find such a cohomology theory (Leichtnam 2005). Zagier (1981) constructed a natural space of invariant functions on the upper half plane that has eigenvalues under the Laplacian operator that correspond to zeros of the Riemann zeta function—and remarked that in the unlikely event that one could show the existence of a suitable positive definite inner product on this space, the Riemann hypothesis would follow. Cartier (1982) discussed a related example, where due to a bizarre bug a computer program listed zeros of the Riemann zeta function as eigenvalues of the same Laplacian operator. Schumayer & Hutchinson (2011) surveyed some of the attempts to construct a suitable physical model related to the Riemann zeta function. The Lee–Yang theorem states that the zeros of certain partition functions in statistical mechanics all lie on a "critical line" with their real part equals to 0, and this has led to some speculation about a relationship with the Riemann hypothesis (Knauf 1999). where λ(n) is the Liouville function given by (−1)r if n has r prime factors. He showed that this in turn would imply that the Riemann hypothesis is true. However Haselgrove (1958) proved that T(x) is negative for infinitely many x (and also disproved the closely related Pólya conjecture), and Borwein, Ferguson & Mossinghoff (2008) showed that the smallest such x is 72185376951205. Spira (1968) showed by numerical calculation that the finite Dirichlet series above for N=19 has a zero with real part greater than 1. Turán also showed that a somewhat weaker assumption, the nonexistence of zeros with real part greater than 1+N−1/2+ε for large N in the finite Dirichlet series above, would also imply the Riemann hypothesis, but Montgomery (1983) showed that for all sufficiently large N these series have zeros with real part greater than 1 + (log log N)/(4 log N). Therefore, Turán's result is vacuously true and cannot be used to help prove the Riemann hypothesis. Connes (1999, 2000) has described a relationship between the Riemann hypothesis and noncommutative geometry, and shows that a suitable analog of the Selberg trace formula for the action of the idèle class group on the adèle class space would imply the Riemann hypothesis. Some of these ideas are elaborated in Lapidus (2008). Louis de Branges (1992) showed that the Riemann hypothesis would follow from a positivity condition on a certain Hilbert space of entire functions. However Conrey & Li (2000) showed that the necessary positivity conditions are not satisfied. Despite this obstacle, de Branges has continued to work on an attempted proof of the Riemann hypothesis along the same lines, but this has not been widely accepted by other mathematicians (Sarnak 2005). The Riemann hypothesis implies that the zeros of the zeta function form a quasicrystal, meaning a distribution with discrete support whose Fourier transform also has discrete support. Dyson (2009) suggested trying to prove the Riemann hypothesis by classifying, or at least studying, 1-dimensional quasicrystals. When one goes from geometric dimension one, e.g. an algebraic number field, to geometric dimension two, e.g. a regular model of an elliptic curve over a number field, the two-dimensional part of the generalized Riemann hypothesis for the arithmetic zeta function of the model deals with the poles of the zeta function. In dimension one the study of the zeta integral in Tate's thesis does not lead to new important information on the Riemann hypothesis. Contrary to this, in dimension two work of Ivan Fesenko on two-dimensional generalisation of Tate's thesis includes an integral representation of a zeta integral closely related to the zeta function. In this new situation, not possible in dimension one, the poles of the zeta function can be studied via the zeta integral and associated adele groups. Related conjecture of Fesenko (2010) on the positivity of the fourth derivative of a boundary function associated to the zeta integral essentially implies the pole part of the generalized Riemann hypothesis. Suzuki (2011) proved that the latter, together with some technical assumptions, implies Fesenko's conjecture. Deligne's proof of the Riemann hypothesis over finite fields used the zeta functions of product varieties, whose zeros and poles correspond to sums of zeros and poles of the original zeta function, in order to bound the real parts of the zeros of the original zeta function. By analogy, Kurokawa (1992) introduced multiple zeta functions whose zeros and poles correspond to sums of zeros and poles of the Riemann zeta function. To make the series converge he restricted to sums of zeros or poles all with non-negative imaginary part. So far, the known bounds on the zeros and poles of the multiple zeta functions are not strong enough to give useful estimates for the zeros of the Riemann zeta function. So the density of zeros with imaginary part near T is about log(T)/2π, and the function S describes the small deviations from this. The function S(t) jumps by 1 at each zero of the zeta function, and for t ≥ 8 it decreases monotonically between zeros with derivative close to −log t.
points where the function S(t) changes sign. This suggests that S(T)/(log log T)1/2 resembles a Gaussian random variable with mean 0 and variance 2π2 (Ghosh (1983) proved this fact). In particular |S(T)| is usually somewhere around (log log T)1/2, but occasionally much larger. The exact order of growth of S(T) is not known. There has been no unconditional improvement to Riemann's original bound S(T)=O(log T), though the Riemann hypothesis implies the slightly smaller bound S(T)=O(log T/log log T) (Titchmarsh 1986). The true order of magnitude may be somewhat less than this, as random functions with the same distribution as S(T) tend to have growth of order about log(T)1/2. In the other direction it cannot be too small: Selberg (1946) showed that S(T) ≠ o((log T)1/3/(log log T)7/3), and assuming the Riemann hypothesis Montgomery showed that S(T) ≠ o((log T)1/2/(log log T)1/2). Numerical calculations confirm that S grows very slowly: |S(T)| < 1 for T < 280, |S(T)| < 2 for T < 6800000, and the largest value of |S(T)| found so far is not much larger than 3 (Odlyzko 2002). Riemann's estimate S(T) = O(log T) implies that the gaps between zeros are bounded, and Littlewood improved this slightly, showing that the gaps between their imaginary parts tends to 0. Hadamard (1896) and de la Vallée-Poussin (1896) independently proved that no zeros could lie on the line Re(s) = 1. 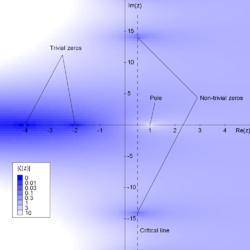 Together with the functional equation and the fact that there are no zeros with real part greater than 1, this showed that all non-trivial zeros must lie in the interior of the critical strip 0 < Re(s) < 1. This was a key step in their first proofs of the prime number theorem. Hardy (1914) and Hardy & Littlewood (1921) showed there are infinitely many zeros on the critical line, by considering moments of certain functions related to the zeta function. Selberg (1942) proved that at least a (small) positive proportion of zeros lie on the line. Levinson (1974) improved this to one-third of the zeros by relating the zeros of the zeta function to those of its derivative, and Conrey (1989) improved this further to two-fifths. Most zeros lie close to the critical line. More precisely, Bohr & Landau (1914) showed that for any positive ε, all but an infinitely small proportion of zeros lie within a distance ε of the critical line. Ivić (1985) gives several more precise versions of this result, called zero density estimates, which bound the number of zeros in regions with imaginary part at most T and real part at least 1/2+ε. has infinitely many real zeros. lying on the interval (0, T]. and therefore confirmed the Selberg conjecture. The estimates of Selberg and Karatsuba can not be improved in respect of the order of growth as T → ∞.
. This estimate is quite close to the one that follows from the Riemann hypothesis. where Hardy's function Z and the Riemann–Siegel theta function θ are uniquely defined by this and the condition that they are smooth real functions with θ(0)=0. By finding many intervals where the function Z changes sign one can show that there are many zeros on the critical line. To verify the Riemann hypothesis up to a given imaginary part T of the zeros, one also has to check that there are no further zeros off the line in this region. This can be done by calculating the total number of zeros in the region and checking that it is the same as the number of zeros found on the line. This allows one to verify the Riemann hypothesis computationally up to any desired value of T (provided all the zeros of the zeta function in this region are simple and on the critical line). Some calculations of zeros of the zeta function are listed below. So far all zeros that have been checked are on the critical line and are simple. (A multiple zero would cause problems for the zero finding algorithms, which depend on finding sign changes between zeros.) For tables of the zeros, see Haselgrove & Miller (1960) or Odlyzko. 1859? 3 B. Riemann used the Riemann–Siegel formula (unpublished, but reported in Siegel 1932). 1903 15 J. P. Gram (1903) used Euler–Maclaurin summation and discovered Gram's law. He showed that all 10 zeros with imaginary part at most 50 range lie on the critical line with real part 1/2 by computing the sum of the inverse 10th powers of the roots he found. 1914 79 (γn ≤ 200) R. J. Backlund (1914) introduced a better method of checking all the zeros up to that point are on the line, by studying the argument S(T) of the zeta function. 1925 138 (γn ≤ 300) J. I. Hutchinson (1925) found the first failure of Gram's law, at the Gram point g126. 1935 195 E. C. Titchmarsh (1935) used the recently rediscovered Riemann–Siegel formula, which is much faster than Euler–Maclaurin summation. It takes about O(T3/2+ε) steps to check zeros with imaginary part less than T, while the Euler–Maclaurin method takes about O(T2+ε) steps. 1936 1041 E. C. Titchmarsh (1936) and L. J. Comrie were the last to find zeros by hand. 1953 1104 A. M. Turing (1953) found a more efficient way to check that all zeros up to some point are accounted for by the zeros on the line, by checking that Z has the correct sign at several consecutive Gram points and using the fact that S(T) has average value 0. This requires almost no extra work because the sign of Z at Gram points is already known from finding the zeros, and is still the usual method used. This was the first use of a digital computer to calculate the zeros. 1956 15000 D. H. Lehmer (1956) discovered a few cases where the zeta function has zeros that are "only just" on the line: two zeros of the zeta function are so close together that it is unusually difficult to find a sign change between them. This is called "Lehmer's phenomenon", and first occurs at the zeros with imaginary parts 7005.063 and 7005.101, which differ by only .04 while the average gap between other zeros near this point is about 1. 1968 3500000 Rosser, Yohe & Schoenfeld (1969) stated Rosser's rule (described below). 1986 1500000001 van de Lune, te Riele & Winter (1986) gave some statistical data about the zeros and give several graphs of Z at places where it has unusual behavior. 1987 A few of large (~1012) height A. M. Odlyzko (1987) computed smaller numbers of zeros of much larger height, around 1012, to high precision to check Montgomery's pair correlation conjecture. 1992 A few of large (~1020) height A. M. Odlyzko (1992) computed a 175 million zeros of heights around 1020 and a few more of heights around 2×1020, and gave an extensive discussion of the results. 2004 10000000000000 and a few of large (up to ~1024) heights X. Gourdon (2004) and Patrick Demichel used the Odlyzko–Schönhage algorithm. They also checked two billion zeros around heights 1013, 1014, ..., 1024. A Gram point is a point on the critical line 1/2 + it where the zeta function is real and non-zero. Using the expression for the zeta function on the critical line, ζ(1/2 + it) = Z(t)e − iθ(t), where Hardy's function, Z, is real for real t, and θ is the Riemann–Siegel theta function, we see that zeta is real when sin(θ(t)) = 0. This implies that θ(t) is an integer multiple of π, which allows for the location of Gram points to be calculated fairly easily by inverting the formula for θ. They are usually numbered as gn for n = 0, 1, ..., where gn is the unique solution of θ(t) = nπ. running from 0 to 50. 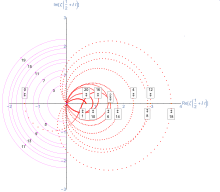 The consecutively labeled zeros have 50 red plot points between each, with zeros identified by concentric magenta rings scaled to show the relative distance between their values of t. Gram's law states that the curve usually crosses the real axis once between zeros. The first failure of Gram's law occurs at the 127'th zero and the Gram point g126, which are in the "wrong" order. A Gram point t is called good if the zeta function is positive at 1/2 + it. The indices of the "bad" Gram points where Z has the "wrong" sign are 126, 134, 195, 211, ... (sequence A114856 in the OEIS). A Gram block is an interval bounded by two good Gram points such that all the Gram points between them are bad. A refinement of Gram's law called Rosser's rule due to Rosser, Yohe & Schoenfeld (1969) says that Gram blocks often have the expected number of zeros in them (the same as the number of Gram intervals), even though some of the individual Gram intervals in the block may not have exactly one zero in them. For example, the interval bounded by g125 and g127 is a Gram block containing a unique bad Gram point g126, and contains the expected number 2 of zeros although neither of its two Gram intervals contains a unique zero. Rosser et al. checked that there were no exceptions to Rosser's rule in the first 3 million zeros, although there are infinitely many exceptions to Rosser's rule over the entire zeta function. Gram's rule and Rosser's rule both say that in some sense zeros do not stray too far from their expected positions. The distance of a zero from its expected position is controlled by the function S defined above, which grows extremely slowly: its average value is of the order of (log log T)1/2, which only reaches 2 for T around 1024. This means that both rules hold most of the time for small T but eventually break down often. Indeed, Trudgian (2011) showed that both Gram's law and Rosser's rule fail in a positive proportion of cases. To be specific, it is expected that in about 73% one zero is enclosed by two successive Gram points, but in 14% no zero and in 13% two zeros are in such a Gram-interval on the long run. Mathematical papers about the Riemann hypothesis tend to be cautiously noncommittal about its truth. Of authors who express an opinion, most of them, such as Riemann (1859) or Bombieri (2000), imply that they expect (or at least hope) that it is true. The few authors who express serious doubt about it include Ivić (2008) who lists some reasons for being skeptical, and Littlewood (1962) who flatly states that he believes it is false, and that there is no evidence whatsoever for it and no imaginable reason that it would be true. The consensus of the survey articles (Bombieri 2000, Conrey 2003, and Sarnak 2005) is that the evidence for it is strong but not overwhelming, so that while it is probably true there is some reasonable doubt about it. Some of the arguments for (or against) the Riemann hypothesis are listed by Sarnak (2005), Conrey (2003), and Ivić (2008), and include the following reasons. Several analogues of the Riemann hypothesis have already been proved. The proof of the Riemann hypothesis for varieties over finite fields by Deligne (1974) is possibly the single strongest theoretical reason in favor of the Riemann hypothesis. This provides some evidence for the more general conjecture that all zeta functions associated with automorphic forms satisfy a Riemann hypothesis, which includes the classical Riemann hypothesis as a special case. Similarly Selberg zeta functions satisfy the analogue of the Riemann hypothesis, and are in some ways similar to the Riemann zeta function, having a functional equation and an infinite product expansion analogous to the Euler product expansion. However, there are also some major differences; for example they are not given by Dirichlet series. The Riemann hypothesis for the Goss zeta function was proved by Sheats (1998). In contrast to these positive examples, however, some Epstein zeta functions do not satisfy the Riemann hypothesis, even though they have an infinite number of zeros on the critical line (Titchmarsh 1986). These functions are quite similar to the Riemann zeta function, and have a Dirichlet series expansion and a functional equation, but the ones known to fail the Riemann hypothesis do not have an Euler product and are not directly related to automorphic representations. At first, the numerical verification that many zeros lie on the line seems strong evidence for it. However, analytic number theory has had many conjectures supported by large amounts of numerical evidence that turn out to be false. See Skewes number for a notorious example, where the first exception to a plausible conjecture related to the Riemann hypothesis probably occurs around 10316; a counterexample to the Riemann hypothesis with imaginary part this size would be far beyond anything that can currently be computed using a direct approach. The problem is that the behavior is often influenced by very slowly increasing functions such as log log T, that tend to infinity, but do so so slowly that this cannot be detected by computation. Such functions occur in the theory of the zeta function controlling the behavior of its zeros; for example the function S(T) above has average size around (log log T)1/2 . As S(T) jumps by at least 2 at any counterexample to the Riemann hypothesis, one might expect any counterexamples to the Riemann hypothesis to start appearing only when S(T) becomes large. It is never much more than 3 as far as it has been calculated, but is known to be unbounded, suggesting that calculations may not have yet reached the region of typical behavior of the zeta function. with probability 1. The Riemann hypothesis is equivalent to this bound for the Möbius function μ and the Mertens function M derived in the same way from it. In other words, the Riemann hypothesis is in some sense equivalent to saying that μ(x) behaves like a random sequence of coin tosses. When μ(x) is non-zero its sign gives the parity of the number of prime factors of x, so informally the Riemann hypothesis says that the parity of the number of prime factors of an integer behaves randomly. Such probabilistic arguments in number theory often give the right answer, but tend to be very hard to make rigorous, and occasionally give the wrong answer for some results, such as Maier's theorem. The calculations in Odlyzko (1987) show that the zeros of the zeta function behave very much like the eigenvalues of a random Hermitian matrix, suggesting that they are the eigenvalues of some self-adjoint operator, which would imply the Riemann hypothesis. However all attempts to find such an operator have failed. There are several theorems, such as the weak Goldbach conjecture for sufficiently large odd numbers, that were first proved using the generalized Riemann hypothesis, and later shown to be true unconditionally. This could be considered as weak evidence for the generalized Riemann hypothesis, as several of its "predictions" turned out to be true. Lehmer's phenomenon (Lehmer 1956) where two zeros are sometimes very close is sometimes given as a reason to disbelieve in the Riemann hypothesis. However one would expect this to happen occasionally just by chance even if the Riemann hypothesis were true, and Odlyzko's calculations suggest that nearby pairs of zeros occur just as often as predicted by Montgomery's conjecture. Patterson (1988) suggests that the most compelling reason for the Riemann hypothesis for most mathematicians is the hope that primes are distributed as regularly as possible. ^ Knapowski, Stanisław (1962). "On sign-changes of the difference π(x)-li(x)". Acta Arithmetica. 7 (2): 107–119. doi:10.4064/aa-7-2-107-119. ISSN 0065-1036. ^ p. 75: "One should probably add to this list the 'Platonic' reason that one expects the natural numbers to be the most perfect idea conceivable, and that this is only compatible with the primes being distributed in the most regular fashion possible..."
Bombieri, Enrico (2000), The Riemann Hypothesis – official problem description (PDF), Clay Mathematics Institute, retrieved 2008-10-25 Reprinted in (Borwein et al. 2008). Conrey, J. Brian (2003), "The Riemann Hypothesis" (PDF), Notices of the American Mathematical Society: 341–353 Reprinted in (Borwein et al. 2008). Hadamard, Jacques (1896), "Sur la distribution des zéros de la fonction ζ(s) et ses conséquences arithmétiques", Bulletin de la Société Mathématique de France, 14: 199–220 Reprinted in (Borwein et al. 2008). Hardy, G. H. (1914), "Sur les Zéros de la Fonction ζ(s) de Riemann", C. R. Acad. Sci. Paris, 158: 1012–1014, JFM 45.0716.04 Reprinted in (Borwein et al. 2008). Haselgrove, C. B. (1958), "A disproof of a conjecture of Pólya", Mathematika, 5 (2): 141–145, doi:10.1112/S0025579300001480, ISSN 0025-5793, MR 0104638, Zbl 0085.27102 Reprinted in (Borwein et al. 2008). Leichtnam, Eric (2005), "An invitation to Deninger's work on arithmetic zeta functions", Geometry, spectral theory, groups, and dynamics, Contemp. Math., 387, Providence, RI: Amer. Math. Soc., pp. 201–236, doi:10.1090/conm/387/07243, MR 2180209 . Montgomery, Hugh L. (1973), "The pair correlation of zeros of the zeta function", Analytic number theory, Proc. Sympos. Pure Math., XXIV, Providence, R.I.: American Mathematical Society, pp. 181–193, MR 0337821 Reprinted in (Borwein et al. 2008). Nicely, Thomas R. (1999), "New maximal prime gaps and first occurrences", Mathematics of Computation, 68 (227): 1311–1315, doi:10.1090/S0025-5718-99-01065-0, MR 1627813 . Odlyzko, A. M. (1992), The 1020-th zero of the Riemann zeta function and 175 million of its neighbors (PDF) This unpublished book describes the implementation of the algorithm and discusses the results in detail. Radziejewski, Maciej (2007), "Independence of Hecke zeta functions of finite order over normal fields", Transactions of the American Mathematical Society, 359 (5): 2383–2394, doi:10.1090/S0002-9947-06-04078-5, MR 2276625, There are infinitely many nonisomorphic algebraic number fields whose Dedekind zeta functions have infinitely many nontrivial multiple zeros. Sarnak, Peter (2005), Problems of the Millennium: The Riemann Hypothesis (2004) (PDF), Clay Mathematics Institute, retrieved 2015-07-28 Reprinted in (Borwein et al. 2008). Siegel, C. L. (1932), "Über Riemanns Nachlaß zur analytischen Zahlentheorie", Quellen Studien zur Geschichte der Math. Astron. und Phys. Abt. B: Studien 2: 45–80 Reprinted in Gesammelte Abhandlungen, Vol. 1. Berlin: Springer-Verlag, 1966. Turán, Paul (1948), "On some approximative Dirichlet-polynomials in the theory of the zeta-function of Riemann", Danske Vid. Selsk. Mat.-Fys. Medd., 24 (17): 36, MR 0027305 Reprinted in (Borwein et al. 2008). de la Vallée-Poussin, Ch.J. (1899–1900), "Sur la fonction ζ(s) de Riemann et la nombre des nombres premiers inférieurs à une limite donnée", Mem. Couronnes Acad. Sci. Belg., 59 (1) Reprinted in (Borwein et al. 2008). Apostol, Tom, Where are the zeros of zeta of s? Poem about the Riemann hypothesis, sung by John Derbyshire. Gourdon, Xavier; Sebah, Pascal (2004), Computation of zeros of the Zeta function (Reviews the GUE hypothesis, provides an extensive bibliography as well). Rubinstein, Michael, algorithm for generating the zeros, archived from the original on 2007-04-27 .
de Vries, Andreas (2004), The Graph of the Riemann Zeta function ζ(s) , a simple animated Java applet.